The idea behind the Landscape Architecture design was to look at the color palette of the building which stuck with warm and cool tones and create a threshold like experience for the two usable spaces (spa and firepit/gathering area) without being completely contained. 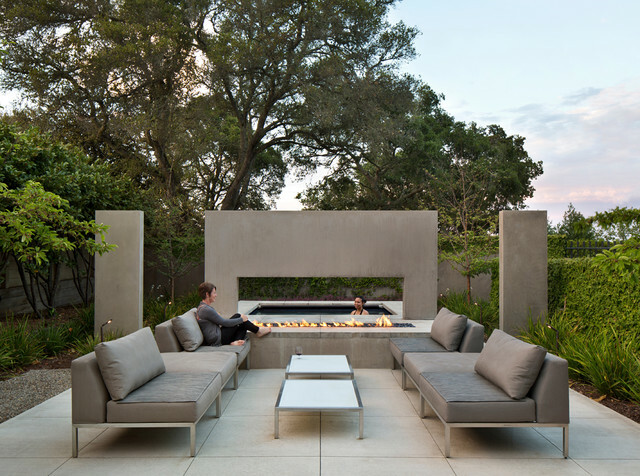 The Concrete frame allows for someone enjoying the spa to enjoy the experience of the fire. Visually the design acts as a center piece that is pleasing to the eye and a unique way to gather and commerce in conversation.